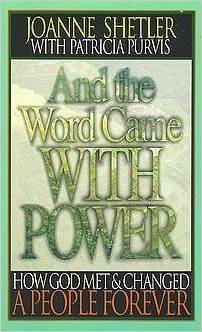 I can’t remember the first time I read the book, And The Word Came with Power. I do know I was young enough to be rather disgusted that the front cover had no photos and opinionated enough that I thought the title was too long. But, somehow I overcame those reservations, and soon the story of farm girl JoAnne Shetler and the Balangao people of the Philippines captured my heart and imagination. Jo found her way amid the missionary heroes of old...fitting in somewhere among Gladys Alward, Amy Carmichael, George Mueller and others. I know I read it again in high school, when I felt compelled day after day for two years to pray about serving in Bible translation, and found the same questions I was wrestling with, Jo had wrestled with too. In college, when I finally bowed my head and said yes, Lord, I’ll go, I grabbed my old copy with the green cover and read it over and over. What in the world was I getting myself into? This past week, JoAnne Shetler arrived in Papua New Guinea to lead a Culture Meets Scripture workshop here in Ukarumpa. I was delighted to meet this lovely lady who had so impacted my journey, and be able to sit and listen to her stories and testimony the other night, many of which now hold much deeper meaning for me as I recognized many similarities between the Filipino and Papua New Guinean cultures. The workshop is a week-long training for local believers to help them develop biblical responses to and understanding of deep-seated practices in their own culture. For example, many aspects of daily life in Papua New Guinea revolve around the belief (and experience) of sorcery, evil spirits, charms, spells, and dreams. How is the Christian supposed to respond to these in a way that both honors his culture and follows the Bible? This workshop equips the local Christians to critically examine their own cultures and not only develop a biblical response (whether by altering the ritual or replacing it with something that would be just as culturally poignant), but also it encourages and equips them to stand strong in the face of the deep societal pressure and incredible tension that can be placed on believers when they choose to act differently. From July 8-15th, I’m privileged to go to this workshop along with quite a few of the guys from the Kamano-Kafe translation team (actually, there are supposedly over 80 participants total from many local languages!). We appreciate your prayers for these men as they seek to lead their people in godly practices; many of them are pastors and prominent leaders in their community. Also, you can pray for my limited energy this next week, that I’ll be able to make it through the entire workshop and still be a coherent, wise adviser as we delve into the Scriptures. I look forward to sharing with you more stories about this workshop. In the meantime, if you haven’t read it, I encourage you to pick up a copy of And The Word Came with Power!